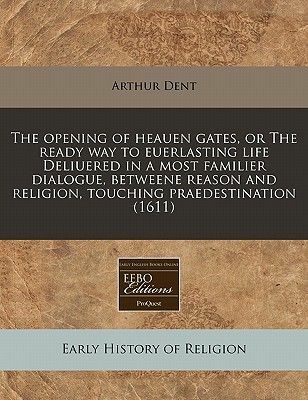 "The opening of heauen gates, or The ready way to euerlasting life Deliuered in a most familier dialogue, betweene reason and religion, touching praedestination"
Running title reads: The way to euerlasting life reel 590. Identified as STC 6619a on UMI microfilm. Imprinted at London:! By G. Eld] for Iohn Wright, and are to bee sold at his shoppe at Christ-Church gate, 1611.